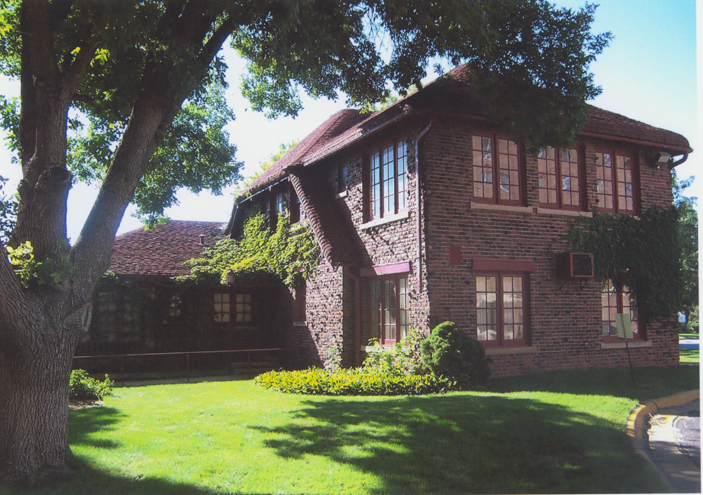 Tom Dennison’s Northwest Omaha home at 7510 Military Ave. Pictured here in 2006, shortly before it was demolished. It took a while, but I was finally able to track down the exact address (and approximate location) of Tom Dennison’s estate house! More accurately, Gary Rosenberg, Douglas County Historical Society archivist, was able to track it down. Thanks, Gary and the DCHS! The address? 7510 Military Avenue. ORDER KINGS OF BROKEN THINGS, A NEW NOVEL ABOUT DENNISON-ERA OMAHA! Dennison remarried late in life, but his young wife, Nevajo Truman, never lived in the same house as Tom. She lived at 2201 Country Club Avenue with her mother. Tom would come by and visit most every day, but that’s as far as that went. Such a strange and sad sounding relationship. Tom Dennison with his second wife, Navajo Truman. Last year I hypothesized that Dennison’s house was put to new use as part of Marian High School–specifically the convent–but was disabused of that notion by Sister Joy (another devoted archivist, this time with the Servite Sisters). I wasn’t too far off, however. As told by my sister-in-law and Marian alumna, Sara Magnuson West, the house was still on the Marian campus until recently, although she didn’t remember if it served a purpose there. She remembers that it was back by the motherhouse, where the nuns live. Maybe it was torn down when the soccer field and athletic complex was built? Gary Rosenberg tells me that the building was demolished in 2006, approximately. I’d greatly appreciate it if you could share any information, stories, memories, or rumors you might have of the building. Do you know what it was used for, if anything, by Marian? Do you know anything about the history of the house? Do you have friends or family who went to Marian, or taught there? Maybe they know something? In the picture above, the house appears to have been kept in good shape, there were security lights installed, the windows were maintained. I’d imagine this effort wasn’t for nothing. If you know something about this house, please pass it along. I visited the house as a child. My dad recalled that the house was much smaller than he remembered. He also remembered that his grandfather had a kennel there as well. I believe the location was on the corner of Military and Lawndale Dr. That corner up to Graceland was surrounded by fence. There was a gated entrance leading to a long driveway that ran up to the house. I thought the original house was torn down. I think the Loucks lived there. Eventually the area was replaced by the bank and Skyline Manor. That’s fascinating, John. Was Frances Dennison Ragan your grandmother then? Wow. I’d love you send you an e-mail sometime with a few questions I have. Do you think that would be all right? Sure. I’d like to send some better pictures of tom dennison and my family too. That would be awesome. If you could send me an email (tedwheeler@gmail.com) I would appreciate it. Ted I sent you some pictures taken in 1930’s. I have many more. I have trouble with my email so if you can send questions this way it would be great. Thanks John. Sorry to be slow in responding. Thanks for the pictures you’ve sent so far. They’re awesome! Please keep sending them along as you have time. If there’s a different way that’s easier to send them–like if I mailed you a flash drive to save them to that you could mail back to me–please let me know. Would it be okay to post these of this blog too? I’d love to share them, with your permission, of course. Also, if you have anything around the World War I years that would be particularly nice, as those are the years my novel takes place. I haven’t been able to find any pictures of the house on Yates Street where the Dennisons lived for many years. I found this description of the house in “Omaha: a guide to the city and its environs,” a WPA sponsored book written in the 1930s. Hi Ted: Yes you have our ok to use the pictures. As for your request for pictures from ww1 era I don’t have our that many. I don’t have any about the Yates home either. I do have a photo of my grandparents with my grandfather in his Ww1 uniform as well as my greatgrandmother Ada Dennison around that time as well. Do you want those? Hi, John. That would be great if you could send along those photos of your grandfather in his WWI uniform, and those of Ada Dennison. I don’t know that I’ve ever seen a photo of Ada, so that would be very helpful. Thanks, John! I really appreciate that. There really aren’t that many photos out there (just the same 5 used over and over, it seems) so it’s great to add something new to the Dennison lore. The WWI photos sound awesome. Send them along! I’m open to receiving as much as you’d like to send, honestly. Please don’t feel like you’d be overwhelming me, as that wouldn’t be the case. I’m very excited about this! He Ted: I would like to talk about the Dennison house on Military. I have been researching it for years and running into dead ends. I was able to enter and salvage the house days before it was taken down. I have some stuff from the house, and would love any information about the stuff. Hopefully Mr. Ragan could aswer some questions. Thanks and hope to talk about this. Hi, Teresa! Thanks for commenting. I haven’t read Face of a Naked Lady, but I’ll have to check it out. Sounds like a great read. The house wasn’t at 7510 Military (This would be Marian High as even house numbers are North and West sides of the street. The entire property covered the NE corner of Keystone at 72nd and Military. The house was up where Skyline Manor is now. The house sat in the parking lot until torn down. Staff stated they watched the house being torn down from the building. The OWH has articles about Skyline being built on Dennison’s former home. The address was 7300 Graceland Dr at least for Skyline, You can see the house in Atlases from 1958 from above. Google Earth shows the house as well. The entire corner of the neighborhood was a very impressive estate. With two stone gates at the corner. I hope this helps future readers. Thanks the info. From what I was told by the DCHS and others (https://theodore-wheeler.com/tag/tom-dennison/) is that this address would have been correct during Tom Dennison’s life, but would have changed at some point. I talked to a few people who thought maybe the road was moved at some point, or that there was an error that needed to be corrected. I added a link at the top here with better information. Sorry if this is confusing, the pitfalls of blogging.